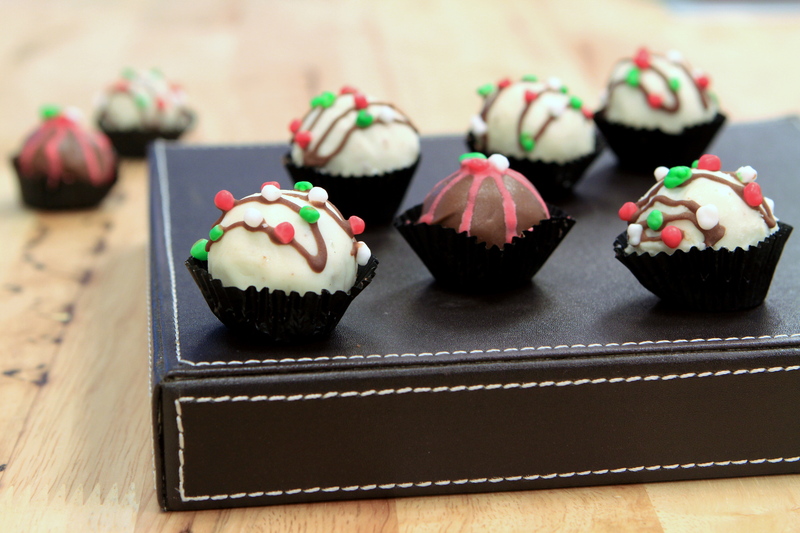 These fudgy Brownie Cake Balls are great not only for Christmas but any occasion. Bake the brownies mix as directed on the box. Let it cool completely. Crumble the cake into fine crumbs using hands or food processor. Put into a bowl. In another bowl, beat together butter and Nutella until creamy. Combine the cake crumbs and Nutella mixture. Mix thoroughly, until it sticks together. The mixture should be moist enough to roll into 1 1/2 inch balls and still its round shape. After rolling the cake balls by hand (or you can use a mini ice cream scoop to get uniform-size cake balls), place them on a wax paper-covered baking sheet. Cover with plastic wrap and chill for at least 2 hours in the refrigerator, or place in the freezer for about 20 minutes. Melt the white and milk chocolate (separately) in microwave or in a bowl over a pan of barely simmering water. Take a cake ball and dip in the chocolate. Shake gently until the excess has drained off. Repeat with the remaining cake balls. Leave to dry completely for about 20 minutes. Pipe icing and sprinkle frosty nerds candy over the cake balls for decoration of your choice. Enjoy your homemade cake balls!